For the synthetic organic chemist, the expansion of a common process that leads to the arrangement of carbon-carbon bonds is considered a laudable accomplishment. A common technique that effects in the simultaneous formation of 2 carbon-carbon bonds is valuable of a Nobel Prize. In the year 1950, two chemists, Otto Diels and Kurt Alder, received that accolade for their discovery of a general method of preparing cyclohexene derivatives that is now recognized as the Diels-Alder reaction. The Diels-Alder reaction is one kind of a broader class of reactions that are identified as pericyclic reactions. Pericyclic reactions are the concerted reactions including reorganization of electrons that take place via the way of a single cyclic transition state. Pericyclic reactions symbolize a significant class of concerted (single step) procedures involving π-systems. The fact that the reactions are concerted provides fine stereochemical control of the product; though, this module is more concerned through the common kinds of pericyclic reaction, than by regio and stereochemical control. In the year 1965 two other Nobel laureates, Robert B.Woodward and Roald Hoffmann, published a series of short communications in that they presented a theoretical origin for such well known, but poorly implicit pericyclic reactions. Their theory is said orbital symmetry theory. Consequently other chemists published alternative interpretations of pericyclic reactions, one said frontier orbital theory, and another named aromatic transition state theory. All of such theories are depend upon MO theory. In this module we will employ the Diels-Alder reaction to demonstrate aspects of each of such theories. Pericyclic reactions, which engross a redistribution of bonding and non-bonding electrons in a cyclic, concerted manner, are a significant class of organic reactions. Since the publications of the Woodward-Hoffmann rules on the conservation of orbital symmetry and the frontier molecular orbital theory (FMO) by Fukui first described in the late 1960s, the underlying principles of these processes at the molecular level have become fully understood. Many modern organic chemistry textbooks include pericyclic reactions as a major topic. They are usually covered in detail in a typical introductory organic chemistry course. Among the two fundamental approaches to pericyclic reactions, the FMO approach has gained some popularity at the undergraduate teaching level. It is simpler and can be based on a pictorial approach. A detailed understanding of molecular orbital theories and symmetry isn't required. Pericyclic reactions enclose a cyclic transition state. While in this transition state, a concerted rearrangement of the electrons happens that reasons σ and π-bonds to simultaneously break and form. Pericyclic reactivity can be understood in terms of frontier molecular orbital (FMO) theory and the outcome of reactions can be supposed using the Woodward-Hoffmann rules. Pericyclic reactions are popular through synthetic chemists since the reagents and conditions are mild and the reactions are usually very "clean" unlike so many organic chemical reactions that consequence in the formation of huge quantities of brown-black, smelly by-product of unknown composition. Pericyclic reaction includes various simultaneous bond-making and bond-breaking procedures through a cyclic evolution state including delocalized electrons. The amalgamation of steps is said a concerted procedure where in-betweens are skipped. We distinguish between concerted and stepwise reaction mechanisms on the basis of absence and presence of in-between(s). Historically, pericyclic reactions were unusual in that they were clearly significant in practice but seemed to have 'no mechanism'; for instance, no intermediates could be identified. A concerted reaction mechanism might be synchronous or asynchronous. The term "synchronous" is utilized when multiple bond-making or bond-breaking events occur to the similar extent at the evolution state. Of course, perfect synchronicity is hardly ever attained. The HOMO is the "highest occupied molecular orbital". The LUMO is the "lowest unoccupied molecular orbital". Mutually, such are the frontier molecular orbitals (FMO). If there is an orbital at the similar energy level as a p orbital, this is an NBMO (nonbonding molecular orbital). In compounds for that a MO has just one electron, the orbital occupied via that electron is a SOMO (singly occupied molecular orbital). Reactions that proceed via almost simultaneous reorganization of bonding electron pairs through way of cyclic evolution states have been termed pericyclic reactions. A pericyclic reaction is characterized as a transform in bonding relationships, which takes place as a continuous, concerted reorganization of electrons. The term "concerted" specifies that there is one single transition state and therefore no intermediates are included in the procedure. To sustain continuous electron flow, pericyclic reactions take place through cyclic transition states. The cyclic transition state must communicate to an arrangement of the participating orbitals that has to sustain a bonding interaction between the reaction components throughout the course of the reaction. 1. The pericyclic reactions take place in single step and therefore there is no intermediate shaped during the reaction. 2. They are comparatively unaffected via solvent transforms, the presence of radical initiators or scavenging reagents, or via electrophilic or nucleophilic catalysts. 3. They proceed through a simultaneous (concerted) series of bond breaking and bond making events in a single kinetic step, in a cyclic transition state, frequently by elevated stereo specificity. 4. No ionic, free radical or other discernible intermediates lie on the reaction path. 5. The configuration of the product depends on: (i) the configuration of reactants (ii) The number of electron pairs undergoing reorganization and (iii) the reaction conditions (like thermal or photochemical). Suprafacial and antarafacial shifts for pericyclic reactions, new stereo chemical designations are needed. Cycloaddition reactions and sigmatropic rearrangements both engage pairs of σ- bond-making events (or a coupled bond-making & bond-breaking) connected by a π-electron system. If all the bonding events happen on the equivalent face of the π-system the configuration of the reaction is said suprafacial. If the bonding events take place on conflicting sides or faces of the π-system the reaction is said antarafacial. 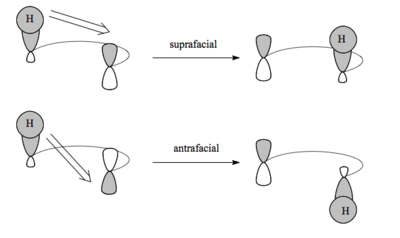 For π systems and lone pairs, suprafacial interactions engage similar face; antarafacial interactions involve opposite faces. For σ systems, the terms are explained as exposed. A dissimilar notation for configurational change is needed for electrocyclic reactions. In such cases an σ-bond between the ends of a conjugated π-electron system is either made or broken by a corresponding loss or gain of a π-bond. For this to happen, the terminal carbon atoms of the conjugated π- electron system must be rehybridized through an accompanying rotation or twisting of approximately 900. The lobes of like sign can be either on the similar side or on conflicting sides of the molecule. For a bond to structure, the outermost pi lobes must rotate so, which favorable bonding interaction is attained. If lobes of like sign are on opposite sides of the molecule: both orbitals must rotate in the similar direction, clockwise or counterclockwise .Woodward said this motion conrotatory. That is, when viewed along the axis of rotation, the two end groups might turn in the similar direction, called conrotatory. 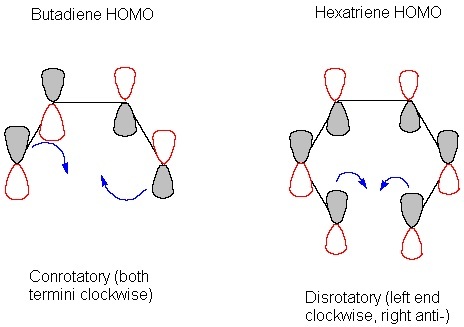 If two lobes of as sign are on the similar side of the molecule, the two orbitals must rotate in opposite directions-one clockwise and one counterclockwise .Woodward called this a disrotatory opening or closure. When viewed along the axis of rotation, the two end groups may turn in the opposite directions, termed disrotatory. The prefixes con and dis might be remembered via connection by their presence in the words concur & disagree. Such two modes electrocyclic reactions are exposed in the diagram in the common form in that they are most commonly examined. To form the new σ-bond in the electrocyclic reaction, the p orbitals at the end of the conjugated system must go beyond head-to-head. Migration of a group across the same face of the pi system is a suprafacial rearrangement Migration of a group from one face of the pi system to the other face is said an antarafacial rearrangement. Cycloadditions Two or more molecules or molecular components (from now on, "components") react mutually to form two or more bonds in a new ring. It should be noted for a sense of completeness that not all cycloadditions are pericyclic, and that they can take place in a stepwise manner. This allows the selection rules to be broken (for instance [2+2] additions and so on. can occur). The reactions can be made stepwise via equipping one reagent by an influential electron-donating group (nucleophilic) and the other through a powerful electron with drawing group (electrophilic). In assigning a cycloaddition to a class we assign descriptors π-, σ- or ω- to the electrons directly included in the procedure (for instance those that move when curly arrows are drawn), count how many electrons are involved in each component, and recognize whether the components are reacting in suprafacial (s) or antarafacial (a) modes. Forbidden reactions and allowed reactions not all cycloaddition reactions are permitted. For instance, [2+2] reactions aren't. This is due to a kinetic barrier to reaction (2 alkenes forming a 4 membered ring is thermodynamically favourable, but kinetically not possible). A "forbidden" reaction is expected to have an electronic barrier on the reaction pathway due to unfavorable orbital properties. An "allowed" reaction isn't expected to have these barriers. Such terms are perhaps overly dramatic, but they specify precisely the tendencies of indeed reactions to take place or not to happen. Usually, a thermal pericyclic reaction is permitted if the number of electrons included can be expressed as 4n+2. 4n is forbidden. Crudely, an odd number of curly arrows are allowed while an even number is forbidden. Conversely, photochemical pericyclic reactions are permitted if the number of electrons is 4n, but not if it is 4n+2. As we know although that when putting that much energy into a reaction, other mechanisms might take precedence.